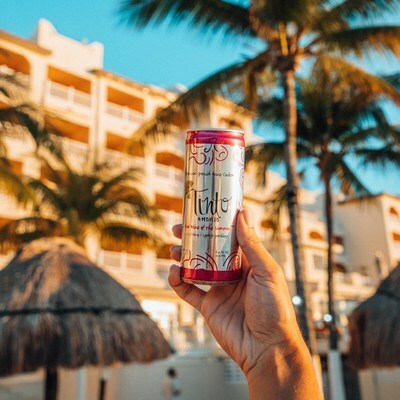 LOS ANGELES, March 19, 2019 /PRNewswire-HISPANIC PR WIRE/ — Tinto Amorío, the creators of canned Spanish-inspired sparkling wine cocktails, announces a significant retail distribution expansion across grocery locations in Southern California. Known for its Red Wine of the Summer™, the brand will be rolled-out by Albertsons across 340+ doors in their Albertsons, Vons, and Pavilions grocery stores in Southern California. Tinto’s Red Wine of the Summer™, a sparkling red wine cocktail with lemon, was introduced in Albertsons’ gourmet grocery chain, Pavilions, last spring 2018. By the end of the summer, it was the #1 best-seller of 70 products in the canned wine category across the chain. The wine cocktails are 110 calories per serving, made with natural ingredients and packaged in 8.4 oz. cans. They can be purchased in 4-pack boxes for a suggested retail price of $19.99, both in stores and online. By May 2019, Tinto Amorío will be available in all Albertsons, Vons, and Pavilions in SoCal. Tinto Amorío crafts Spanish inspired sparkling wine cocktails that are calorie conscious, natural, and socially responsible. 25-year-old founder Anish Patel was inspired to bring the authentic ‘Tinto de Verano’ wine spritzers he enjoyed while studying in Spain to the American market. Tinto Amorío donates a portion of every sale to an organization or charity that creates value in the communities the brand sells to, with each production run dedicated to a new cause. Past charitable partners include the Los Angeles Regional Food Bank and the Second Harvest Food Bank of Orange County. For more information visit drinktinto.com or follow on Instagram @tintoamorio and Facebook.